Over five years ago I worked for an online ad network. I was a technical project manager working with the developers who created our custom ad server. I came on board just as we began to roll out the ability to do geographic targeting and later started creating ways to do some basic behavioral targeting. We were doing some pretty cool things at the time and I’m sure that things have progressed quite a bit over the time I left that world. But I wasn’t aware that the advancement of logic to match ads with users was on a much more psychologically adept path until I read this month’s article in Wired titled “Welcome to the Brave New World of Persuasion Profiling”. Apparently “taste profiling” has improved ad targeting by providing much better recommendations but a technique called “persuasion profiling” is the new rage. Currently delivering ads based on analyzing our product and content consumption data is a widely used method. The next step will be not to only recommend what product to put in front of us, but dynamically determine how to pitch it to us. So basically we all have different triggers that may make us succumb to a purchase. Some of us just want a good deal, others want an authoritative recommendation, while yet others may be more interested in their friends social recommendations (I’m seeing these crop up on Facebook lately). So as these new targeting systems collect the data that elicits us to an action, they will learn and apply those methods across other areas. Most significantly, they found that people respond to the same type of argument in multiple domains. In other words, if you figure out how to sell someone books, you can use the same technique to sell them clothes. And if that finding holds, your persuasion profile will have a pretty substantial financial value. Once a company like Amazon has determined your profile by suggesting products in a variety of ways over time and seeing how you respond, there’s no reason it couldn’t then sell that information to other companies. In other words, if you respond a few times to a “50 percent off in the next 10 minutes!” deal, you could find yourself surfing a web filled with blaring red headlines and countdown clocks. It’s pretty interesting stuff. Beyond just thinking of this as an evil way for companies to improve the way they part us from our money, there are many good things that could come of this and those points are made in the story as well. So I recommend you go read it now and prepare to second guess all of your actions moving forward on the web with the concern that soon it will know you better than you know yourself. 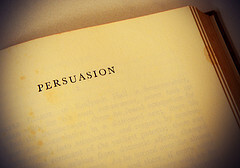 persuasion profiling just rolls off the tongue.